I enjoy Charles Dickens. I don’t (usually) mind his wordy style, ridiculous names, amazingly convenient coincidences, or overblown page counts because he creates such wonderful, memorable characters and situations. That said, it took me several tries over quite a few years before I managed to slog through the first chapter or two of this book. Once the book gets going, it becomes clear that its status as one of Dickens’ most celebrated novels is richly deserved. To me, much of the book’s impact was in the setting and events more than in individual characters, as is more usual with Dickens. I’m not sure how the people of France view the French Revolution, but this book crystallizes the horrified British view of the bloody affair. 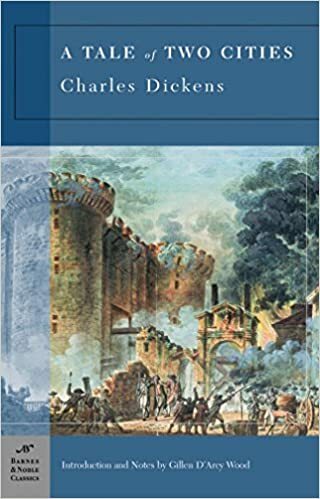 Dickens vividly portrays both the cavalier abuse of the poor by the Ancien Regime and the almost bestial vengeance of the mob once the tables were turned. As always, Dickens’ cast of characters contain a wonderful mixture of the pathetic, the loving/virtuous, the ridiculous, and the loathsome. The two most prominent women were the best of characters and the worst of characters (come on…you know I had to make at least one comment like that). Lucie Manette is virtuous, loving, and completely flat: very much the ideal Victorian “angel in the house”…blech. Madame DeFarge, on the other hand, is truly terrifying as she embodies the bloodthirsty implacability of the Revolution. She may have been the most interesting/memorable character in the book until she was beautifully upstaged at the end by true love and redemption (“It is a far, far better thing that I do…”). Overall, Dickens’ lone foray into historical fiction deserves its reputation. As long as you don’t completely hate Dickens’ style, you should read it. Don’t let the first chapter or two stop you. You’ve totally inspired me to give this another go. I’m making more of an effort with classics this year so I’ve added it to my tbr. Great review! I did struggle with this at first, but eventually got into it and loved it too. Wonderful review!